Anti-Rust Product Poisoning is the accidental or intentional intake (swallowing, breathing-in, or skin contact) of rust-proofing compounds. What is Anti-Rust Product Poisoning? What are the Causes of Anti-Rust Product Poisoning? What are the Signs and Symptoms of Anti-Rust Product Poisoning? The signs and symptoms of Anti-Rust Product Poisoning can vary from one individual to another. It may be mild in some and severe in others. Several systems of the body, such as the vascular system, nervous system, digestive system, respiratory system, and ENT may be affected. How is First Aid administered for Anti-Rust Product Poisoning? Who should administer First Aid for Anti-Rust Product Poisoning? 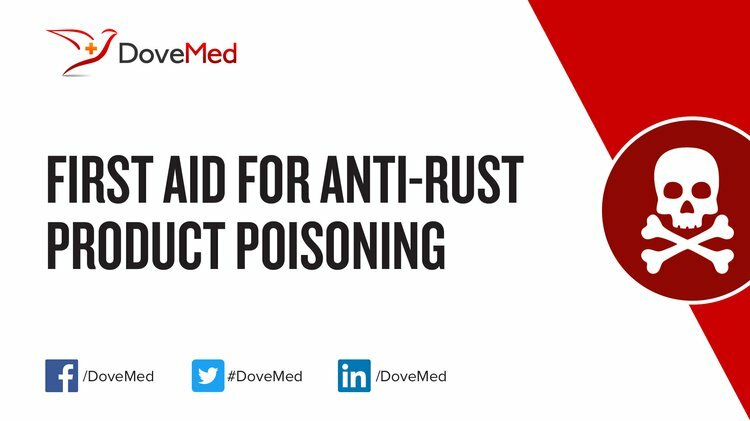 First aid for Anti-Rust Product Poisoning is administered by healthcare professionals. What is the Prognosis of Anti-Rust Product Poisoning? How can Anti-Rust Product Poisoning be Prevented? Fox, M. F. (2010). Chemistry and technology of lubricants (Vol. 107115). R. M. Mortier, & S. T. Orszulik (Eds.). Berlin: Springer. Yu, Y., Guo, Y., Wang, L., & Tang, E. (2010). Development of environmentally friendly water-based synthetic metal-cutting fluid. Modern Applied Science, 4(1), 53. Youjun, G., Liang, T., & Yongqiang, X. (2011). Development of One Component Epoxy Zinc-Rich Primer with High Zinc Powder Level [J]. Paint & Coatings Industry, 7, 013. Yang, G. X., Zheng, L. B., He, J. Z., Xie, W., & Su, D. (2014). Study on Applications of Water Soluble Grinding Fluids in Glass Processing with 3MTM TrizactTM Diamond Tile (TDT). In Key Engineering Materials (Vol. 589, pp. 269-274). Trans Tech Publications. LI, L., ZUO, B. Y., GAO, E. S., & ZONG, J. (2012). The Research of a New Type Phosphate of anti-corrosion on the Surface of Steel Plate. Journal of Salt and Chemical Industry, 3, 004. Cuojie, W. E. N., Shuangtian, W. A. N. G., & Suling, S. H. A. N. (2011). Preparation and usage of a low foaming water-based detergent. Cleaning World, 11, 009. FANG, J. H., CHEN, B. S., WANG, J., & WU, J. (2012). The Development of Environmentally Friendly Micro-Emulsion Cutting Fluid. Lubricating Oil, 1, 006. Dargan, P. I. (2016). Corrosives. Medicine, 44(3), 153-156. Jothi, J. S., & Uddin, M. B. (2014). Detection of heavy metals in some commercial brands of noodles. European Academic research, 2(8), 10667-10677.